This edition was available as a pre-order only to countries outside the USA. 750 copies were sent to the UK and Ireland for sale at independent record stores. The total number of pressings of this edition is 1,500 copies. The release date in Australia was 15th May 2015. The release date for the rest of the world receiving this pressing was 18th May 2015. The record comes in a gold-foil printed gatefold sleeve. The record is housed in a printed inner sleeve. "Limited edition. Gold vinyl. includes download. RRIPCOO2LPX"
A barcode sticker affixed to the shrinkwrap on the rear cover obscures the barcode printed directly on the artwork. Manufactured & distributed by [PIAS]. 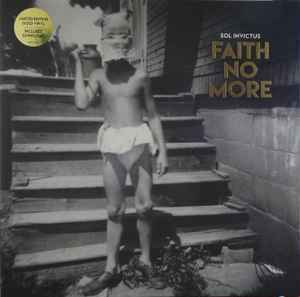 The Faith No More Facebook page issued a statement about a fault with the gold vinyl to be issued in the USA. I have a gold one (pre-ordered from JB Hi-Fi Australia) and I'm curious to know if there is any sound quality issue. By the way, has somebody seen black version of this album...? Sounds good—a bit too quiet maybe? Love the gold—but is anyone else's a tad wobbly? very nice one ! sound and colour! Here in Sweden you can also buy the Gold Vinyl on record stores. Please confirm if this edition is exclusive to Australia or Worlwide. And please confirm if there is only 1500 copies of it. Thanks!! I have only seen info of this limited version on Clear vinyl, not gold. I think this is a mistake, as i just ordered three. I could be wrong, if it sold out completely, but usually shows you it was offered but sold out. Please let me know!